The first Formula E race is officially in the books! Taking place in Beijing, the race was won by Lucas di Grassi after a horrifying last lap shunt between Nicolas Prost and Nick Heidfeld, which will surely make the news bulletins around the world in the next day or two. But overall, in my opinion it was a good start to the series and it definitely has the building blocks for something bigger, assuming it doesn’t fall over within the next year or two. Over here in the UK, the coverage given by ITV4 this morning was very good. Jennie Gow presented the programme with Jann Mardenborough and engineer Kyle Wilson-Clarke as guests. Wilson-Clarke was fine as a guest, Mardenborough looked a bit stilted in front of the camera, but nothing embarrassing. It may well have been the first high profile studio role for all three, I know Gow’s motor sport presenting has largely been trackside, so for the first go, with a new formula, it was a good build-up. I did read one or two people commenting that the build-up was too long. On the other hand, I’d argue that it is a wonderful change seeing something other than Formula 1 getting hours of air-time on free-to-air television. ITV4 didn’t have to ‘go the extra mile’, but they chose to and in my opinion they should be applauded for that. There’s also nothing telling viewers that they must tune in for the entire hour of build-up, the purpose of it is to build viewership as the race approaches and catch a few more viewers channel hopping as well (okay, that technique may not work for a race starting at 09:00, but it will for later races). They might have chosen to have an hour build-up as well so they could fit in the ad-breaks, notably the race ran advert free which I was very relived to see! No live qualifying or practice, I suspect viewing figures will dictate the approach going forward on that front, it should be noted that some broadcasters did air qualifying live. Let’s not forget that from Uruguay onwards, qualifying will be at a much more friendly time in the UK, so viewership would be significantly higher than at 05:00. 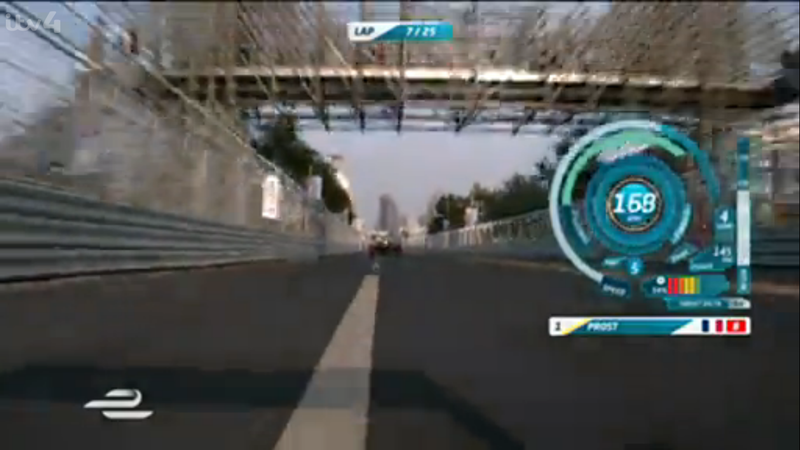 The speedometer on display during the inaugural Formula E race. The revelation for me was the commentary. Jack Nicholls is a gem. Alongside Dario Franchitti, you have a great commentary pairing. Again, a few hiccups along the way, but I don’t envy them commentating on the first race of a brand new series, with unusual liveries and a few driver names that viewers may not recognise. I really enjoyed listening to Nicholls, as I did earlier this year on BBC Radio 5 Live. Let’s not forget Nicholls is only in his mid 20s, should Formula E take off, then Nicholls could become the ‘signature voice’ for the series, but that is an ‘if’ rather than ‘when’. One of the many things talked about before the start of the series was the sound track. I was sceptical about it, but for the most part it worked well. It was kept to being used at the start, replays and during the Safety Car phase. I didn’t feel it was overused, the only part I did not like was hearing music in the closing laps (or at least, it sounded like I could). If used well in future races, as in Beijing, then again it could become a signature for the series. Formula E has to stand out. It will not succeed being ‘another series’, it doesn’t work like that. It had to try different things. Obviously these are all initial thoughts from myself after one viewing, but the music did not detract from the race anywhere near as much as I expected. Another talking point was Fanboost. I’m avoiding commenting on that though, because I didn’t notice it. It didn’t affect the outcome of the race, so there is nothing to say about it, in my view. Onboard with Nelson Piquet, Jnr. during the 2014 Beijing ePrix. I have to admit that the strangest part was the car changes, and I actually thought this looked odd on the broadcast. It should have felt exciting, but it instead came off as a damp squib, it looked slow and cumbersome. Obviously there are safety issues here, as the change has to be done safely, but it needs to be conveyed better on the broadcast in future races. I think it may have helped if Nicholls cut to Nicki Shields and Mark Priestley, I don’t think we heard Shields or Priestley during the race itself, which was a bit disappointing. Onto the graphical side of things, and in standard definition, the graphics looked poor, especially where the battery use was concerned, at one point the writing was too small as well. I suspect it looked good in high definition, but for people like myself who don’t have access to ITV4 HD, the graphics were not great. This might have been an ITV4 fault with them running a low bit-rate, but I don’t know that for fact. Talking of high definition, I’ve read many comments who said that the on-boards looked stunning in high definition. Even though I was watching in standard definition, I agree that there were some fantastic on-boards and camera angles throughout the race. Aurora Media did a great job capturing the speed and chose their angles wisely, especially at the chicanes with the cars looking super aggressive over the kerbs. Admittedly, the cars did look a little slow in the latter stages, but for the first half of the race, I was left feeling ‘wow’. The lack of speed should not be a problem as the series evolves. Unlike A1 Grand Prix, this series has a road map. It was a decent start then again A1GP had a good start too at Brands Hatch all those years ago! Disagree about the music it was awful but thankfully it wasnt there for the whole race. It is symptomatic of the attitude that is spreading in sport that you need to manufacture atmosphere e.g. the pa/big screen telling people to ‘make some noise’. If the action is good enough it will generate its own atmosphere. Did enjoy switching between ITV and Radio Le Mans especially their post race tech show with Sam Collins and Nick Daman was excellent. Offering greater insight than ITV (understandably for a mainstream broadcaster) did. The start was good, the cars get off the line well, however they’re deathly slow and the ‘race’ looked like a parade lap for the most part, the crash on the final lap (thankfully no injuries, except to pride) was the only piece of action to note. The E-J is the most pathetic thing I’ve seen and had to hear in years, and would certainly put me off attending a race, even with all the free tickets. The pit stops are a joke, and only go to highlight the out of date technology being used, and the highly un-environmental nature of the series. Very well balanced article and great to get your take. I also watched live on ITV4 and thought they did a great job overall with all things considered (weird with the poor graphics resolution though). I definitely appreciate the extra time given to the build up and extending the show beyond its scheduled finishing time too. Whilst watching on TV I used my laptop to view the live timings on http://www.fiaformulae.com which worked really well for the first few laps and then kept crashing. Not sure if that’s just me but it looks like they need to upgrade their servers as their site seems to still be unavailable a few hours after the race has finished. Overall I think the series is well set up for success and to attract younger motorsport fans both on TV and to the races themselves (given they are all in major cities). I think the series has got a lot going for it: Technology, environment, widespread TV coverage, high profile drivers, investment from major global motorsport players and so on. I thought the race was pretty good actually. I was quite concerned that seeing as the whole championship is set on street circuits that it was just going to become a bit of a precision of follow the leader, like at the Monaco GP. However, I’m glad there was a lot more overtaking and action than I expected, even excluding the last corner crash. A few little niggles I had with it were the pitstops weren’t shown that clearly, so it was quite a surprise to see Heidfeld in second all of a sudden after the stop. The other thing was that I didn’t like that they cut away from the podium too early, so we didn’t see Sam Bird get his trophy, and also no interview with Sam Bird or Daniel Abt was also a bit disappointing. The main problem I had with was the music, it was just unnecessary and extremely repetitive, especially at the beginning with the 10 minute build up. I don’t know if its because the cars are quiet, that they think they need the music to add to the atmosphere, but it really isn’t needed and I just found it really off putting having music playing over the commentary. Fortunately, like I mentioned above, the race was fairly action packed so that more than made up for the music. Very impressed by what I saw. I think we’ll see a closer battle at the 2nd race as I’m sure a lot of the teams were running fairly conservatively to ensure they didn’t run out of juice. As expected the race wasn’t destroyed by FanBoost, in fact it barely got a mention after the lights went out. I’m kind of expecting that if a FanBoost pass happens they’ll be a fancy graphic that appears ahead of the replay, so we know what has just happened? Will be interesting to see who picks up the boost for race 2. 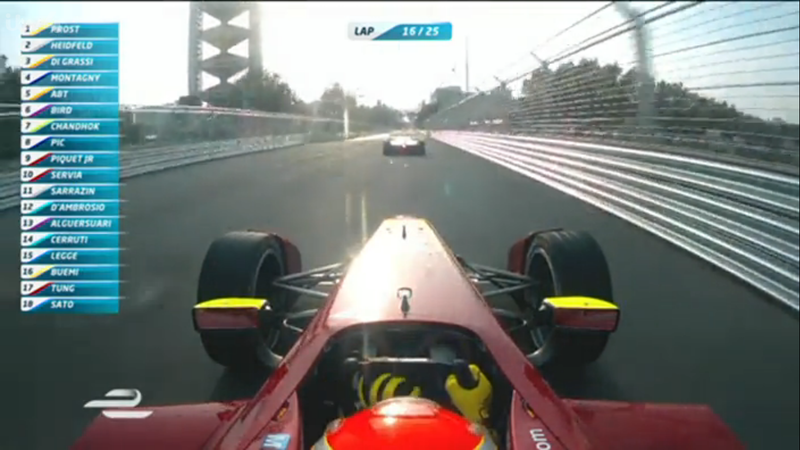 I’d think fans would vote for drivers like Montagny who race hard and also Heidfeld as he lost out. Prost being the villain now hasn’t done his boost chances any good. Didn’t think much of the graphics, the colours made them pretty hard to read on a SD TV and they were too small to be clear. The race itself was good but the car change was ridiculous. Why not just run the race in two halves?